“We ask for full transparency regarding the process of approval to allow the KER logo on the Kraft product— including the names of those involved, the meeting minutes of the discussion, and Board’s vote on this issue. We ask for full disclosure of the terms of the financial agreement between KER Foundation and Kraft. We also request full transparency regarding the status of future agreements under consideration for use of our Logo. This announcement worked to quiet the media storm and pacify the RDs, yet there has never been any confirmation that the contract was actually terminated. None of the other requests in the #RepealTheSeal petition have been met either. Kraft Singles with the “Kids Eat Right” labels hit the store shelves on April 1st and are still there, as you can see from the recent photo I took at my local grocery store. I have asked AND and RDs if the contract was ever terminated, but my question was met with silence. 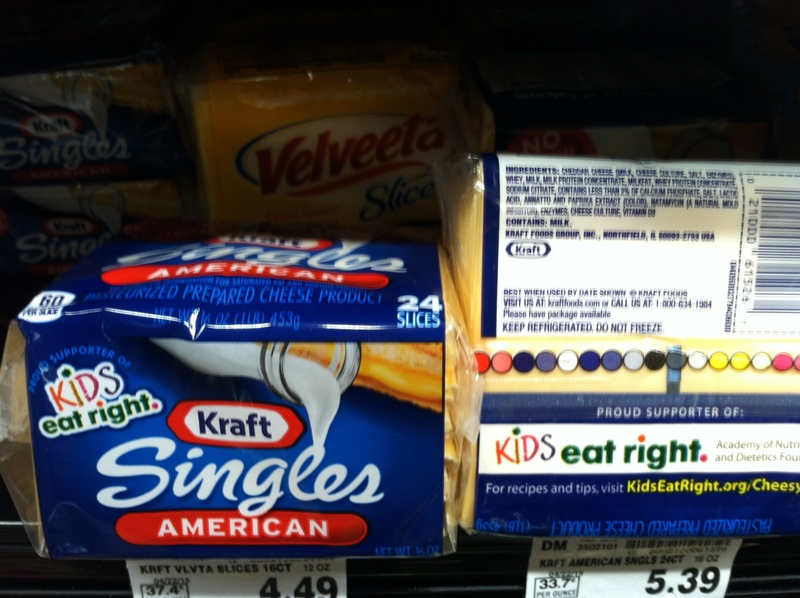 While the silence continues about when #RepealTheSeal will be finalized, seeing “Kids Eat Right” Kraft Singles on the grocery store shelves for over three months now speaks volumes. The initial outcry worked to bring attention to how inappropriate it was for AND to partner with Kraft this way, but without continued follow-up, the public is once again left hanging as the experts fail us. Tags: "Kids Eat Right", Academy Nutrition and Dietetics, Kraft. Bookmark the permalink.